Slack Integration is a group chat tool that could be perfectly integrated with Paradiso LMS. LMS Slack integration unifies the communication within your employees or students in just one place. It works as a channel where you can manage all the information flowing along your company or group of learners. With LMS Slack integration tool you are able to deliver specific information in closed channels, share general comments or notifications in the opened channels or communicate between Slack users on shared channels. The Learning Management System Slack integration also allows you to send direct messages, search for previous conversations or shared content and get notifications, not only from the application’s activities but from our Paradiso LMS. The Learning Management System communicates with users allowing them to send chat notifications related to the LMS directly on Slack integration. The integration between Paradiso LMS and Slack is highly functional since it works as an alert system for teachers and students. It categorizes the information and splits the notifications. It also works as an information channel to announce the arrival of new content in the LMS such as courses, new versions, any novelty or any feedback. The communication channel that comes with the LMS Slack integration can be set up between trainees and trainers, between groups of people or in private sessions and it treats general or specific subjects. The message comes as a support request for the trainer, for example, and they can start chatting right away. This generates a direct link between trainer/trainee, in real time and with personalized assistance, guaranteeing speed and quality on the learning processes and securing that the trainers provide a prompt response, as expected from a classroom. With Learning Management Software Slack integration, you will not only save on the waiting time that the use of e-mail implies but also the spamming and other shortcomings of effective communication. Slack LMS allows you to receive notifications from different activities of the platform. Login to Paradiso LMS platform. Simultaneously log into your Slack account. 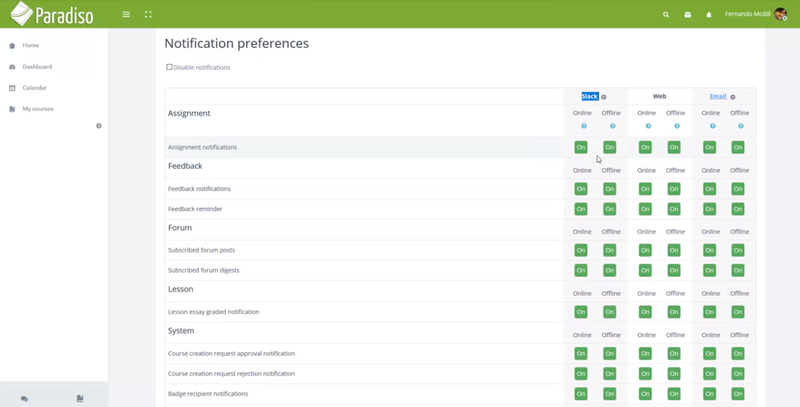 Go to Preferences in Paradiso LMS user menu. Turn on the activities that you want to get notified by Slack. For example, if you turn on the assignments category, every time a new assignment is added you’re users will get a notification both on Paradiso LMS and Slack. 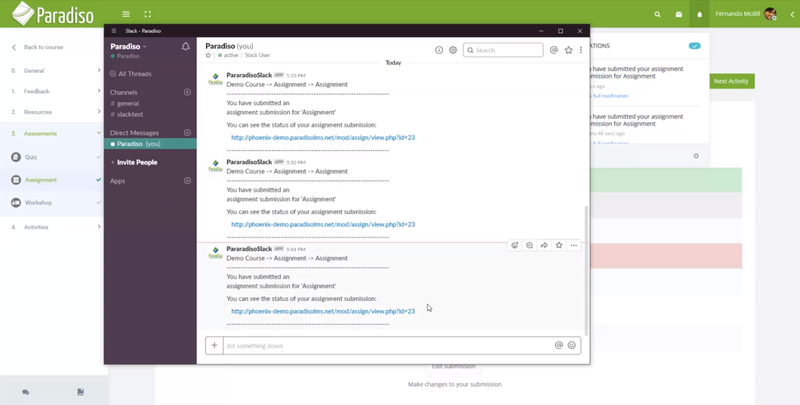 Get to know more about Slack integration plus more than 100 integrations that Paradiso LMS supports referring to our website www.paradisosolutions.com. Start a Free Trial with our Learning Management System, get to 10 users and feel the Paradiso learning experience. 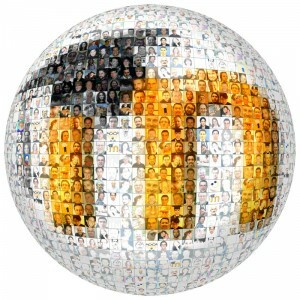 What’s new in the moodle 2.3 release notes? What are the Best Moodle Alternatives? Daniel is an expert in eLearning and LMS solutions. He believes that knowledge is synonymous with wealth. He puts forth invaluable eLearning insights via his blogs for a more meaningful L&D development of his readers. Subscribe to Paradiso's informative eLearning blog and you'll not only keep getting informed but also enjoy some graphic eye candy in his articles.